BASRA, Iraq -- Unknown assailants fired three Katyusha rockets at Iraq's Basra airport Saturday, an airport official said, after a chaotic and violent night that saw hundreds of protesters burning tires on main streets and highways and setting ablaze the Iranian consulate in the city. The protests in Basra are the most serious to shake Iraq's oil-rich southern Shiite heartland in years. Protesters are calling for an end to endemic corruption, soaring joblessness and poor public services and have turned their rage on neighboring Iran, blaming its outsized influence in Iraq's political affairs for their misery. The official said it was not clear who was behind the Saturday morning attack on Basra airport, which also houses the U.S. consulate. He said the attack occurred at about 8 a.m. local time and did not cause casualties or disrupt flights in or out of the city. The official spoke on condition of anonymity, citing security concerns. There was no immediate claim of responsibility for the attack. Iran's Foreign Ministry spokesman, Bahram Ghasemi, condemned the attack, which he said caused significant damage to the building. He called for maximum punishment for the assailants. 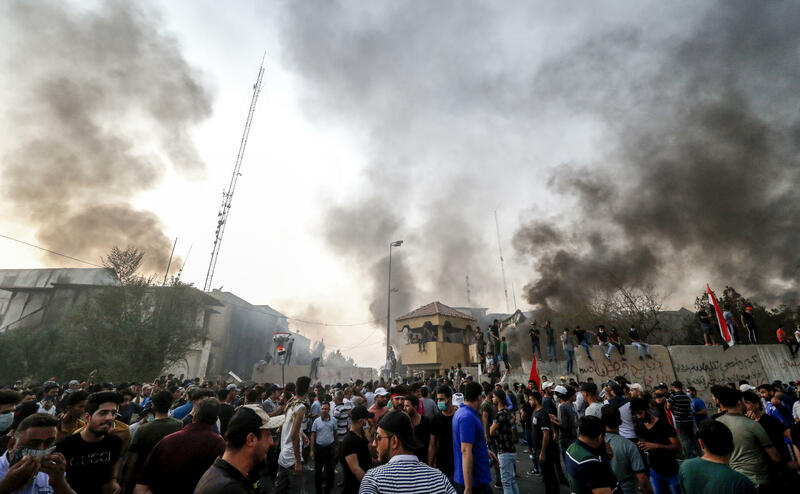 Iraq's most senior Shiite figure, Ayatollah Ali Sistani, blamed political leaders for the unrest and called for a new government "different from its predecessors," BBC News reported. Although the U.S. government has disagreements with Iran, the State Department criticized the attack, without explicitly mentioning Iran. "The United States condemns violence against diplomats, including that which occurred today in Basrah," it said in a statement. Anger has escalated in the city over a lack of jobs, safe drinking water and electricity, according to the BBC. Hundreds have been taken to the hospital after drinking water that was contaminated. Local residents say the government is corrupt and has allowed infrastructure to virtually collapse in the region that generates much of Iraq's oil wealth. Other protesters set tires on fire on main streets and highways, ignoring a curfew imposed by the authorities. More than 10 protesters have died in clashes with security forces since Monday, including three who were shot dead by security forces on Thursday night as protesters lobbed Molotov cocktails and set fire to a government building and offices of Shiite militias in the city. In Thursday's unrest, demonstrators forced the closure of Iraq's main sea port to the south of Basra, the BBC reported. Many residents of the predominantly Shiite city accuse Iranian-backed political parties of interfering with Iraqi politics and some hold them responsible for mismanagement and the poor services in the city.